“If you had asked me several years ago if I thought I would be a full-time faculty member, I probably would have laughed at you,” Daniel Tillapaugh said. Dr. Tillapaugh’s areas of research include college student leadership and LGBT issues in higher education. A lover of his mom’s homemade macaroni and cheese and Kelly Clarkson, east coast native Tillapaugh joined the California Lutheran University team as a professor in the Graduate School of Education this past summer. Tillapaugh is originally from Carlisle, a small rural town in upstate New York. “I grew up on my family’s farm which has been passed down in my family for three generations, from my grandfather to my dad, who then sold it to my cousin,” Tillapaugh said. As an undergrad, he attended Ithaca College where he majored in music with an outside field of sociology, studying voice and concentrating in gender studies. He specialized in college student leadership development at the University of Maryland College Personnel Program for his master’s degree, and moved out to the West Coast for the first time when he attended University of San Diego for his doctorate. Tillapaugh spent 10 years working as a student affairs administrator for several colleges doing various programs including leadership development programs and LGBT student services before teaching. “When I was job searching, I was really hoping to get back to Southern California, and I was excited when I got the offer from Cal Lutheran. Personally, I was happy to be coming back to an area that I loved. After moving away from San Diego, I really missed life on the West Coast and also the friends and family I had here,” Tillapaugh said. At Cal Lutheran, Tillapaugh teaches courses in Organization and Administration of College Student Personnel, College Student Development Theories, Educational Leadership and other counseling-based courses. “It’s been great to be able to have taught so many different courses over this academic year because it’s really helped me become so much more familiar with the curriculum within our program and helping students see all of the connections between them all,” Tillapaugh said. 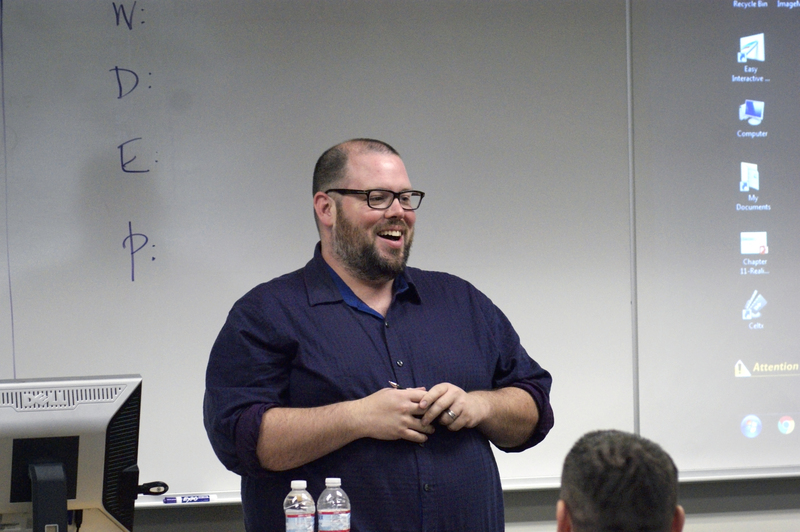 According to the Cal Lutheran website, Tillapaugh also has been working on research that focuses on intersectionality and social contexts of higher education, college men and masculinities, LGBT issues in higher education and leadership development and education. “He is a prolific researcher. He already has lots of publications. He’s one of those persons who is continually thinking about how to study the field and how to make things better for students and the professional,” Gail Uellendahl, department chair of counselor education, said. As a new faculty member, many colleagues have gotten a chance to meet or work with Tillapaugh over the course of the year. “Tillapaugh is a standout scholar and friend. What makes Tillapaugh shine is his wit, charm and warm personality. He is one of the favorite faculty members among our graduate students in the Graduate School of Education,” Edlyn Peña, director of doctoral studies, said. Tillapaugh said teaching many courses has been beneficial to getting to know the curriculum and helping the students make connections. “Tillapaugh has taught me that the best leaders are those that have a genuine desire to foster growth in others. He uses nontraditional teaching techniques within the classroom which serves as a reminder to think creatively in whatever it is we choose to do, and to not be afraid to try new things,” Counseling and College Student Personnel Master’s Candidate Katherine Pierce said. When he’s not teaching, Tillapaugh enjoys traveling and spending time at his home in Long Beach with his husband and friends.